Arduino Nano IO shield is specially designed to facilitate easy connection between Arduino Nano and other devices. 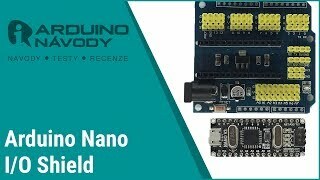 Nano shield is compatible with Arduino Nano v2.x and v3.x. Motherboard NANO V 3.0, driver CH340. Included is the cable. 11,52 € tax incl. 9,52 € tax excl. 8,22 € tax incl. 6,79 € tax excl.